Around 1,500 new homes and flats across major new housing developments in Staffordshire will be able to get some of the fastest broadband speeds in the UK following a deal between Openreach and housing developers. Openreach, the business responsible for Britain’s largest phone and broadband network, is answering a call to build fibre-to-the-premises (FTTP) technology capable of ultrafast speeds up to one Gigabit per second (Gbps) for properties on sites in locations including Burton-on-Trent, Newcastle-Under-Lyme, Streethay, Stafford and Uttoxeter. The agreements are part of an Openreach initiative agreed with the UK Government and the Home Builders Federation to connect all new UK housing developments of 30 properties or more with ultrafast fibre broadband. As well as the schemes in Staffordshire, Openreach has made FTTP technology available to more than 2,000 new developments nationwide, covering more than a quarter of a million premises, since the partnership launched last year. Kim Mears, managing director of infrastructure delivery at Openreach, said: “An ultrafast broadband network will be a major boost for these sites by ensuring that people living and working there have quick access to some of the fastest speeds available. “It reflects our commitment to ensuring that Staffordshire and the UK has a first-class network, capable of delivering the latest communication services for households, businesses and other organisations. 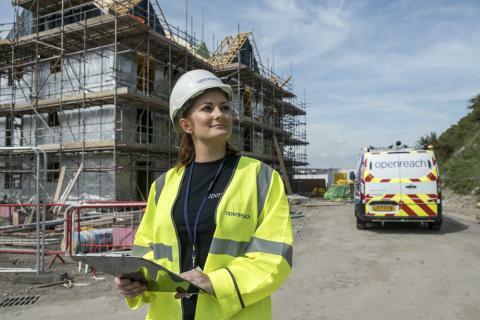 As part of ambitious plans to make ultrafast broadband speeds available to 12 million homes and businesses by 2020 – Openreach will now build an FTTP network for free to all new housing developments with 30 or more homes. This is dependent on developers registering their site with Openreach and working together early in the building process. Openreach has promised to connect new homes within nine months of contracting with a developer. Any developments with two or more homes will have access to the company’s existing or planned fibre infrastructure, either funded entirely by Openreach or, where necessary, with the help of co-funding from the developer. Off New Road, Uttoxeter – St Modwen Developments. For each new development, Openreach’s dedicated New Sites Reception team will work with developers to check the options for a particular site, and give a clear recommendation on the infrastructure that should be built. Once contracted, a dedicated field based co-ordinator will work with the Developer to lead them through the plan and build process. Construction of Fibre to the Premises infrastructure (the ducting, poles and wires) will be carried out for free on developments of more than 30 premises. Standard connection and ongoing service provider charges will apply and excess construction charges will continue to apply where the site is more than 4.5 kilometres from Openreach’s existing fibre network.